I had higher expectations about this image. I was hoping for a 7.XXXX. I guess 14th out of over 600 images is a great result. It's my second best score to date. I love the pic Enzo. The fury of the race is well portrayed. Great action shot. I'm torn over the partial desaturation, personally I like it, but some viewers seem to see it as overall haze. Maybe you could bump red back up to counter that and emphasize the winner. Wonderful image. I love the partial desat... gives it a vintage look! Wonderful image.......sometimes everything just comes together and it certainly has here. Congrats on this. This picture has inspired me to ask my wife for a day off from the kids and home on the next beautiful day to go to the races and give this a go. I love this image Enzo - the colors, the clarity, the captured action - all top notch. 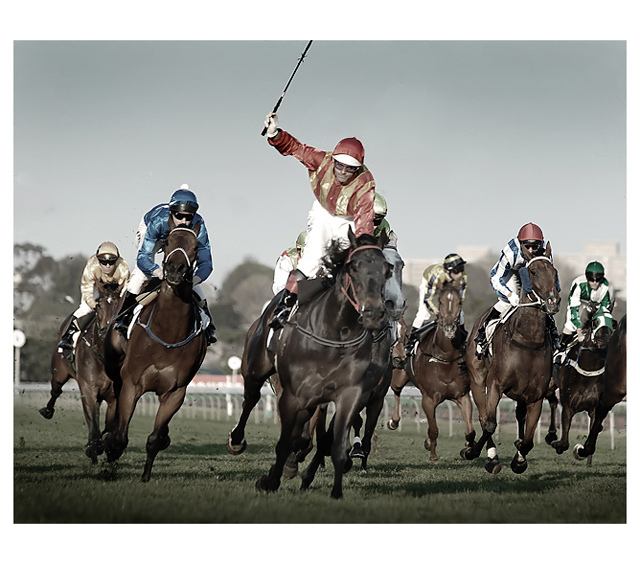 I've been shooting jockeys for about 4 years in hte NYC area, and this is one of the best racing shots I've ever seen. I particularly like that it's a turf race... but the action is flawless, the lighting is beautiful, and the composition is exquisite as well. truly outstanding. I never mentioned how much I love this shot. I'm a huge, huge fan of slight desaturation, and the action in this shot just puts it over the top for me. I too was hoping you'd get a 7+, top-5 (at least) for this, but as you said 14 out of 618 is a lot to be proud of. This is a fantastic shot Enzo! This is exquisite! It reminds me of racing paintings I have seen. Just WOW! Love it. The high voltage action appears to go on even when so well frozen. Congratulations on your top 20 finish. Enzo, your horse pictures are REALLY REALLY GOOD!! Congratulations on your top 20! Congrats on your top20 finish, Enzo. Very nice color processing u did here. Oh Enzo! You outdid yourself on this one! WOW! This is awesome! Mega Congratulations on an awe inspiring photo! Well done Enzo. I wondered if this was taken at the spring carnival, should have figured it was you. Beautifull colours, you have got to get this printed. Excellent work! Can't see much room for improvement. Should do extremely well. A top "winner" for sure! Beautiful action shot, I really like the tuned down color...very well done. I like the PP... it has an antique feel. The stop action is a 10. Remarkable photo. Especially nice moment. 9. Sport photography at its best. Great capture and very nice toning. Good picture, what's up with the obnoxious border? Like the muted tone sin this. I love the slightly muted tones of this photo. Makes it feel like a magazine print or a postcard. Great capture of a great moment. Nice comp. and processing. Good timing with the whip in the air. great action shot, really captures the feel of a race. The reds feel a little muted though. The border i think would have been better off as equal all the way round rather than wider at the top and bottom. Excellent! Love the look and feel of this, almost vintage but still very modern at ths same time. Wonderful composition and light. I like the composition and the colours. Excellent point of view and dof. Love the post-processing on this too. The more I look at the slight desaturation, the more I like it. It's something a little different and it seems to make the colors of the jockey uniforms more appealing to me. i love the muted colours here. what a shot. bring on the melbourne cup. i love this colorful desat look. Neat shot. (not including in voting, just as a side comment) I think you should try selective desat on the photo I think you will like the outcome..
great sports capture, but it feels overprocessed. Sharp shot, great action capture. Proudly hosted by Sargasso Networks. Current Server Time: 04/23/2019 07:53:16 PM EDT.